I realize that the first singletrack trail onto which you turn from Buzzard Lagoon Road on most typical Demo Forest loops is known and referred to as Cusacks Trail. 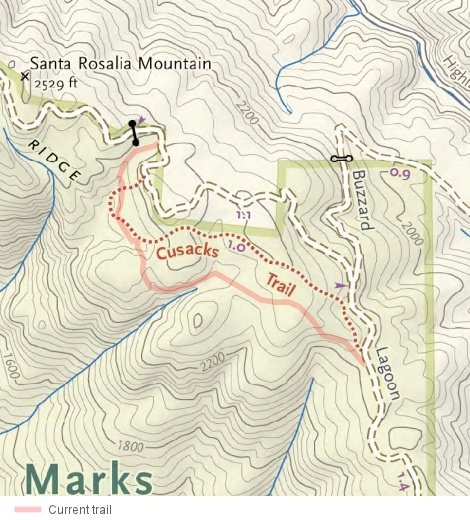 While it's true that a trail named "Cusacks Trail" is represented on trail maps of Soquel Demonstration Forest and of the Forest of Nisene Marks that are detailed enough to show this trail, the route shown for Cusacks Trail on any such digital map I've seen so far has little overlap with GPS tracks recorded on Demo Forest rides. What's on the left, above, is the most detailed PDF park map I've seen that shows Cusacks Trail. I've overlaid on it the rough path of the current trail. On the right is the same patch of land as shown on USGS topographic maps. I've highlighted on the right-hand map the trail matching the route of Cusacks Trail. (You can see this trail more clearly if you click on that map and then follow the link to its unmarked copy.) The map on the right also shows the GPS tracks of the current trail taken from five of my own rides (whose low variance attests to the accuracty of the GPS recordings). Taken together, the two maps above leave little doubt that what maps of the park call "Cusacks Trail" and the current singletrack between Buzzard Lagoon Road and Aptos Creek Road are two separate trails. On the other hand, I haven't yet noticed a trail at this location that follows the path of what "should be" Cusacks Trail (though I haven't gone to great pains to look for it). This might mean that the original Cusacks Trail is out of use. Therefore, since the current trail fulfills more or less the same role as being a singletrack shortcut between roughly the same two points on these two fire roads, it was likely built as a re-routing of the original Cusacks Trail at some point. With that in mind, I'll keep referring to the current trail as "Cusacks Trail" on this website anyway, as the practical successor of the "earlier" Cusacks Trail and also because the newer routing doesn't come with any other name that I know of, though it is a clear break from what Cusacks Trail originally used to be.